The Legendary Castillo de San Pedro de la Roca or Castillo de El Morro is among the bautiful places of the Caribbean city of Santiago de Cuba. 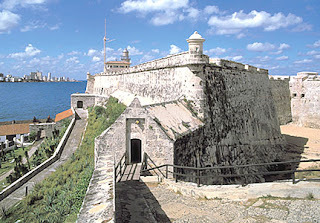 Built initially in 1589 in response to raids on Havana harbor, el Morro protected the mouth of the harbor with a chain being strung out across the water to the fort at La Punta. Morro Castle in Havana shares the name with other structures in Santiago de Cuba and the Castillo de San Felipe del Morro in San Juan, Puerto Rico. In this case "morro" in Spanish means a rock which is very visible from the sea and therefore serves as a navigational landmark. 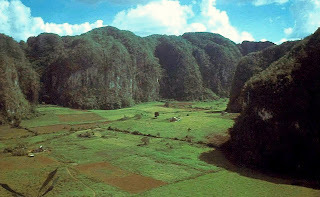 As the most impressive part of the Pinar del Rio province, The Vinales Valley located about 200 km west from Havana city. The Vuelta Abajo region is known for the cultivation of high quality tobacco, this Cuban tobacco is considered by experts as the best tobacco in the world. Despite the many tourist visits the landscape is still natural. One of famous place at this tourist attractions is The "Mogotes", round hills, rock formations of lime stone covered with vegetation and palm trees are charateristic and impressive. The environment and the landscape is so unique that it's added to the UNESCO World Heritage list. 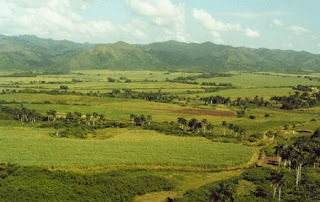 The Valle de los Ingenios (Valley of the Sugar Mills) located in the south-central Cuban city of Trinidad. This 104 square mile area includes three valleys: San Luis, Santa Rosa and Meyer, in an area where the extraordinary development of the Cuban sugar industry began in the 18th century. In that valley still remain the ruins of the numerous sugar refineries that once gave such splendor to the area but which today constitute little more than archaeological artifacts of that industry. One of the best places conserved in the valley are the main house of the sugar magnate Manacas Iznaga and a tower of the same name, which according to legend was built by the owner to keep watch on the slaves working in the sugarcane plantations. Cayo Coco beach is one of the most paradisiacal places in Cuba. 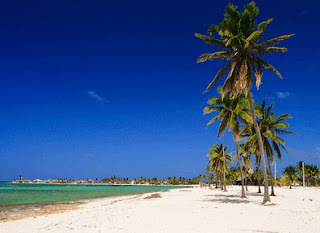 It is located in the north area of Ciego de Ávila province and you may arrive by air or by sea. One of the best engineering works of the Cuban architecture is the embankment that joins the Isla de Turiguanó with the key. By car, the view is amazing: to both sides of the sea which has a blue that one can only observe in the warm waters that surround the island, you can enjoy stands to the front of your sight with an incredible vegetation, and from time to time you may observe groups of flamingos refreshing of the heat in the banks of the highway. 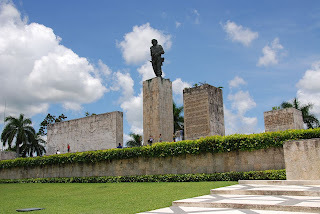 The Che Guevara Mausoleum (Mausoleo Che Guevara) is a memorial in Santa Clara, Cuba. It houses the remains of executed Marxist revolutionary Ernesto "Che" Guevara and sixteen of his fellow combatants killed in 1967 during Guevara's attempt to spur an armed uprising in Bolivia. The full area which contains a bronze 22 foot statue of Che is referred to as the Ernesto Guevara Sculptural Complex. Old Havana is the downtown and one of the 15 districts of Havana, Cuba. The positions of the original Havana city walls are the modern boundaries of Old Havana. 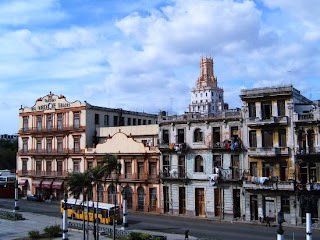 Old Havana is a UNESCO World Heritage Site. Old Havana resembles Cadiz and Tenerife. Alejo Carpentier called it "de las columnas"(of the columns), but it could also be named for the gateways, the revoco, the deterioration and the rescue, the intimacy, the shade, the cool, the courtyards. In her there are all the big ancient monuments, the forts, the convents and churches, the palaces, the alleys, the arcade, the human density. The Cuban State has undertaken enormous efforts to preserve and to restore Old Havana through the efforts of the Office of the Historian of the City, directed by Eusebio Leal. Construction on the church was started by the Jesuits in 1748, who weren't around to see it finished in 1777 — King Carlos III of Spain expelled them from Cuba in 1767. The cathedral's Baroque facade is simultaneously intimate and imposing, and one of the two towers is visibly larger, creating a pleasing asymmetry. The two bells in the taller, thicker tower are said to have been cast with gold and silver mixed into the bronze, giving them their sweet tone. 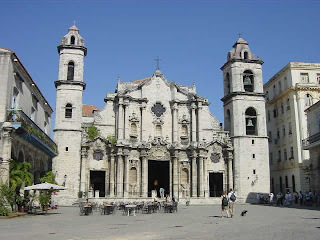 As with many churches in the city, the building material of Havana Cathedral includes coral, cut and hauled from the edge of the sea by slaves. Look carefully and you'll see fossils of marine flora and fauna in the stone of the cathedral. 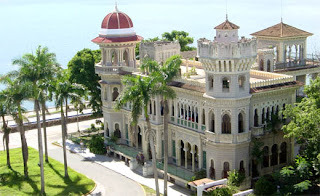 Located in The South coast of the central region of Cuba, Cienfuegos has a singular history which is present in the Castle of Our Mother of Los Angeles of Jagua, loaded of legend that for 250 years has been the only access defending the best sea to one of bays of raft of The Hispanic America. Cienfuegos, capital of the province with the same name, was designed in its definitive layout by French colonos in 1819. The perfect layout of their streets, harmonically conjugated with multiple constructions and other elements of high architectural value, reveals the splendor of a cosmopolitan culture with a strong French accent, and allows the visitor to breathe the neoclassic atmosphere that distinguishes this large city, raised at the border of a bay of strongly rooted marine traditions, in a region also equipped with innumerable natural attractiveness and a vast culinary culture. Hopefully information above about popular tourist attractions in Cuba can help you to plan your vacation. Happy vacation.